Invocation by Param Pujya Swami Paramatmanandaji. 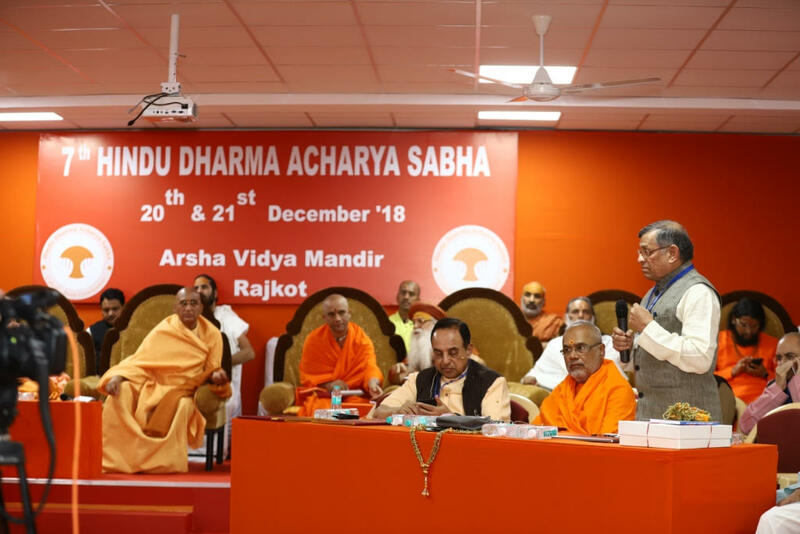 He immediately moved 2/3 resolutions and sought consent of Acharyas and it was unanimously accepted. 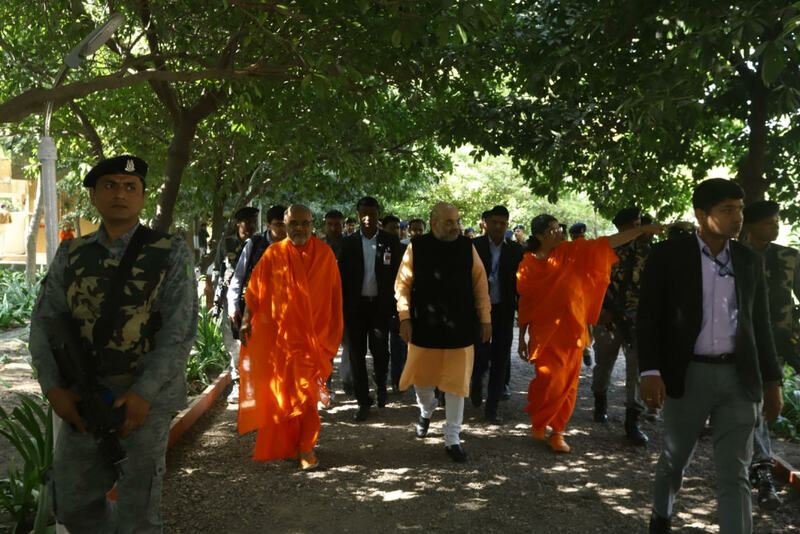 1 Acharyas will celebrate Holi festival with soldier @ border and will explore possibility to establish Hindu Religious Institutions in Kashmir and will discuss issues of Amarnath / vaishnodevi board with governor of Kashmir. 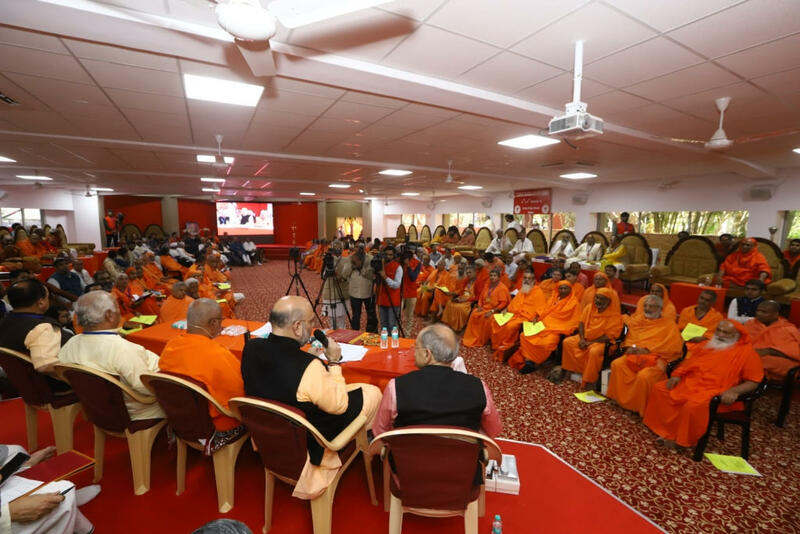 2 Acharya Sabha delegation shall travel to north east states to validate and accept the forms of worship which are followed by residents of those States. 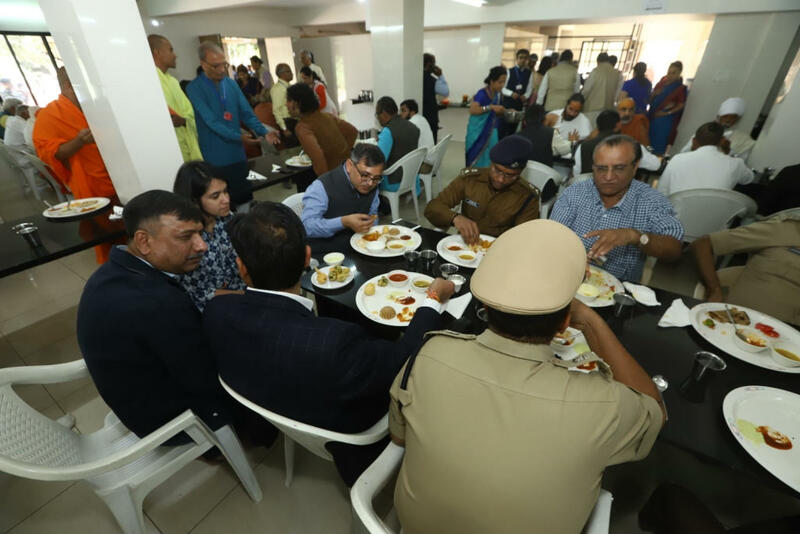 The delegation will also explore possibility of the same Seva Project in these areas. 3 Acharya Sabha delegation will also visit Punjab in 2019. 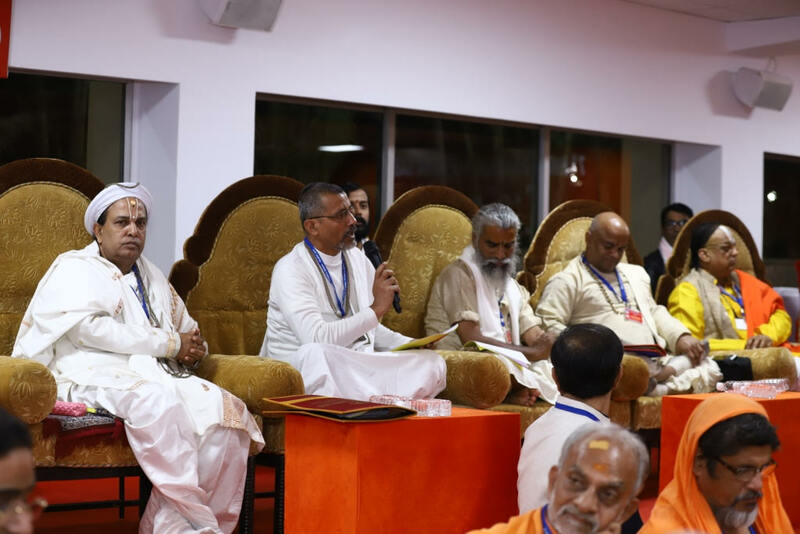 4 A “White Paper On” how to have sustainable value education in India, be presented – which will include inputs from professionals and Swamiji from the field of Education. Previous day Sri Champatji had given status report on Sri Rama Mandir, Ayodhya. Resp. 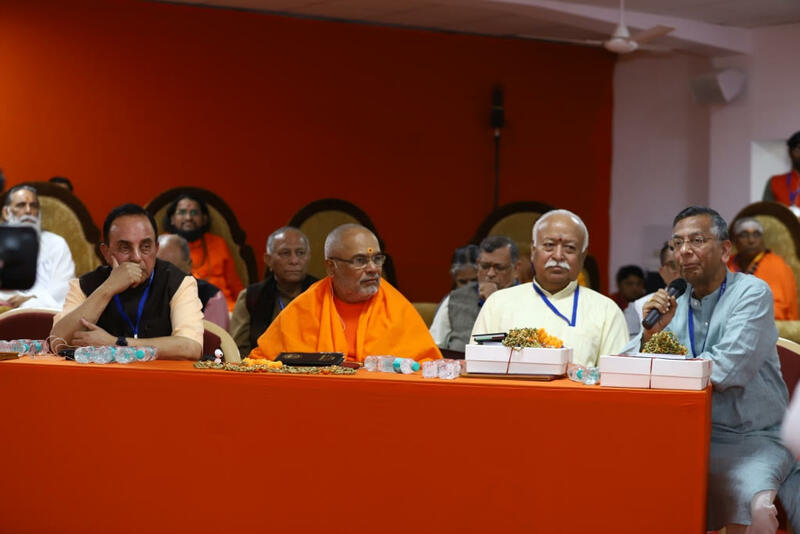 Sri Mohanji Bhagawat in his speech also had made reference to the issue. Since the issue was on most of Acharyas mind, on second day, after P.Pu. 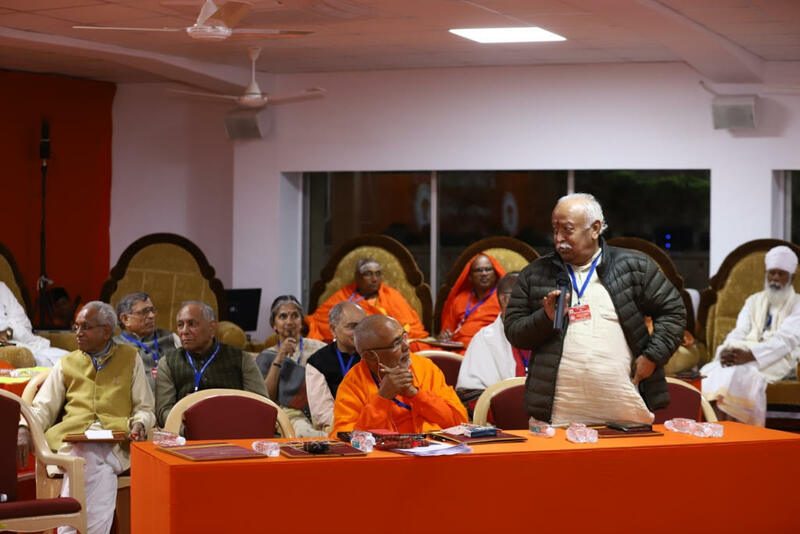 Swami Paramatmanandaji’s introductions, discussions began with the same issue. 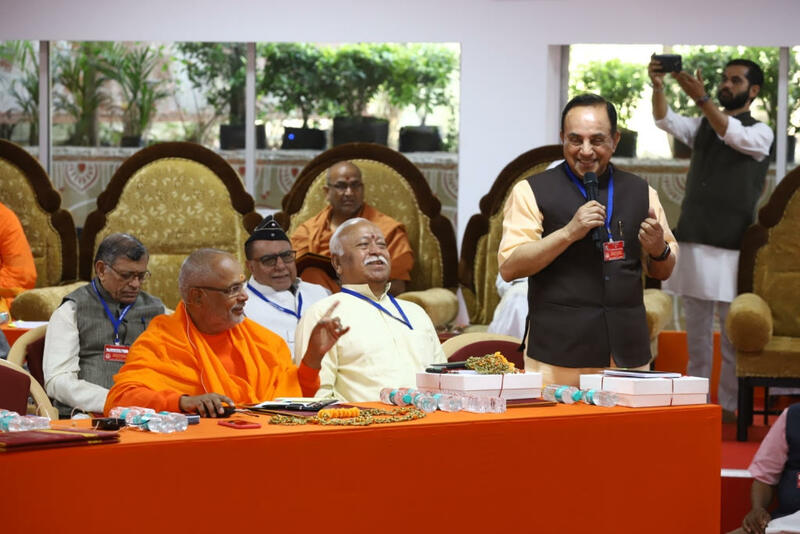 Dr. Subramanian Swamy began remembering P.Pu. 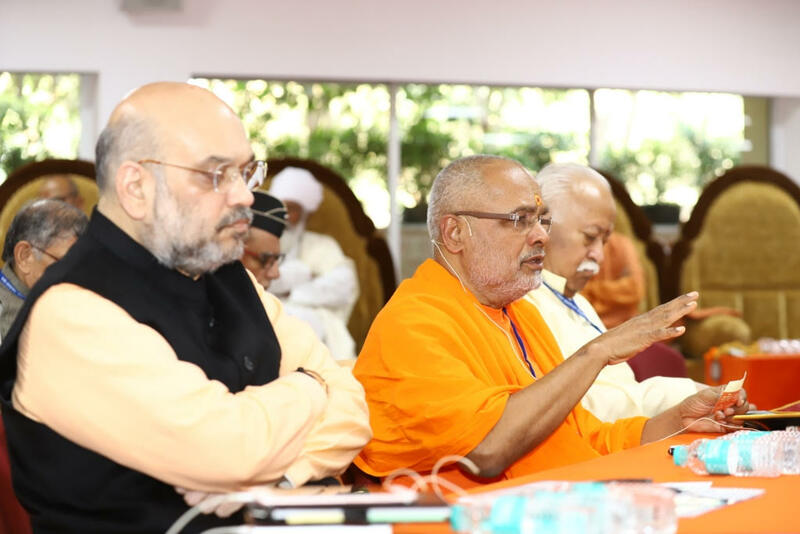 Swami Dayanandaji and gave his inputs regarding important cases pending in Supreme Court, He also gave his opinion/view about Sri Rama Mandir case. 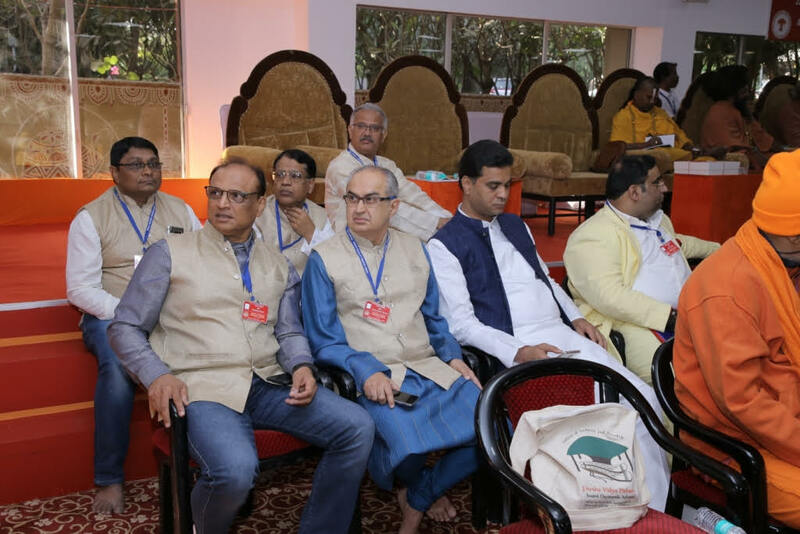 Sri Subhash Chandra (Chairman, Zee TV group, Essel group) gave presentation on invaluable heritage of Hindu Dharma, in terms of Culture & Vedic Wisdom. He said this is a great soft power for us, which can be which should be shared amongst entire humanity for peace & betterment of quality life. He stressed the need for a central Broadcasting Act. 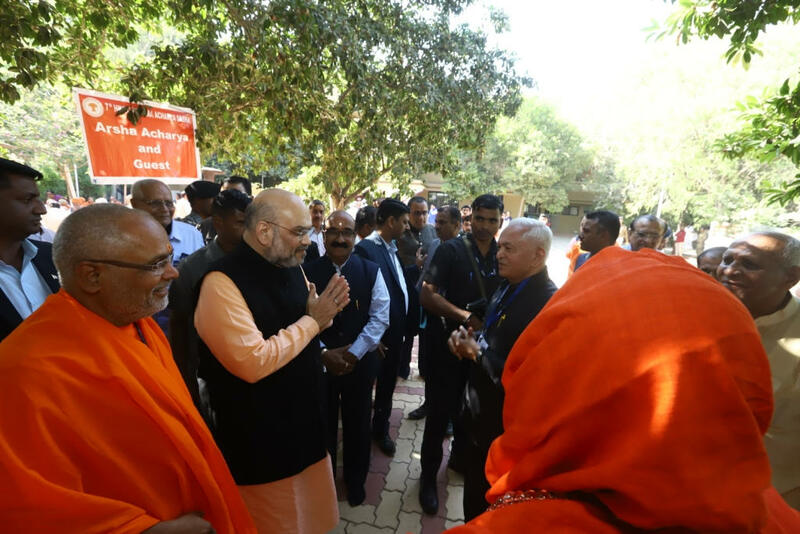 He also emphasised that, electronic Social Media may remain independent but interest of Hindu Dharma & Culture should be protected. Following this, Sri Guru Murthyji ( Leading economist & member R.B.I. 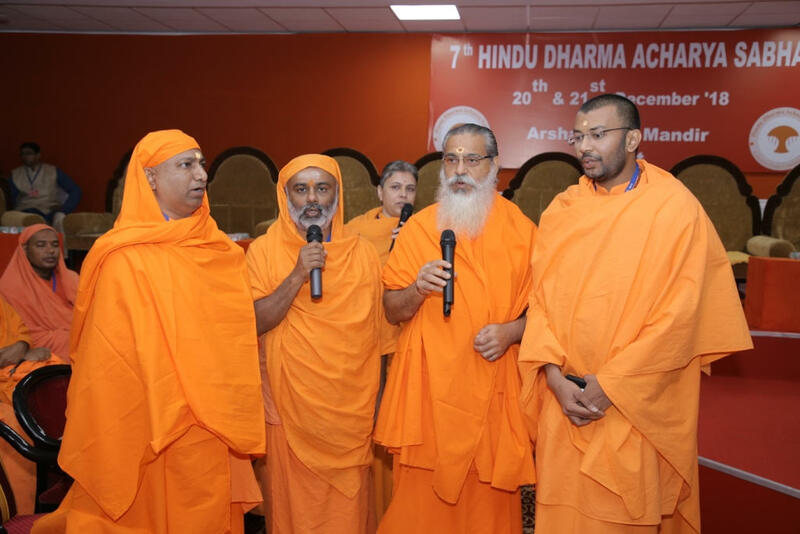 governing Board) gave very inspiring presentation about “Dharma Rakshana Samiti” & Hindu Spiritual & service fair (HSSF). He also mentioned about importance & need for national law on Anti Religious conversion. He also emphasised about strategic approach to interfaith round table conferences. The definition of “Hindu” given by Supreme Court in all inclusive & it should be studied in depth may be discussed. 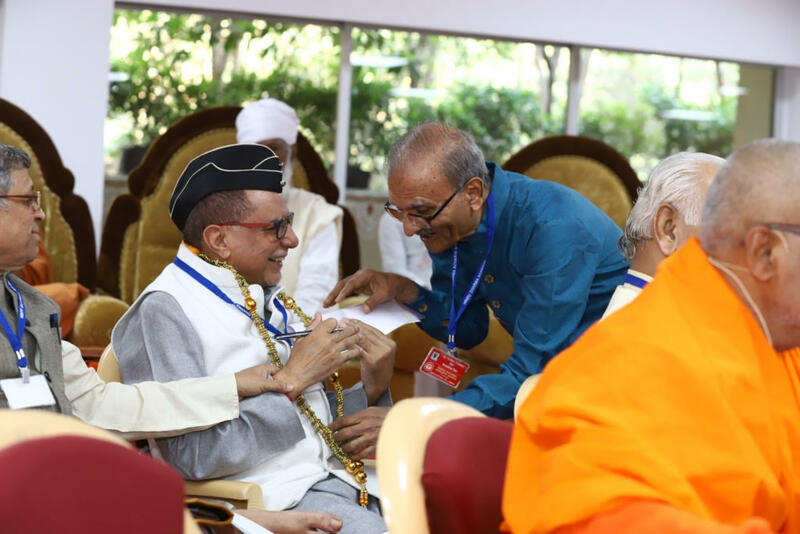 A. Arsh Jnalayam – A spiritual university for Vedic Wisdom. 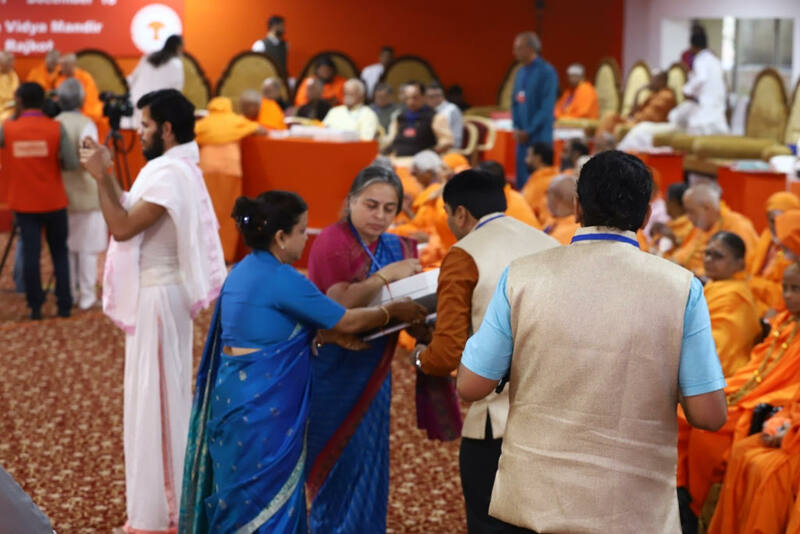 The vision document was inclusive of teaching soft skills & contemporary technology for strengthening Hindu Dharma & Culture. B. Bet Dwarika, needs attention. Hindus have migrated from Bet Dwarika & are leaving Dwarika area. These areas are dominantly occupied by people of other religion. 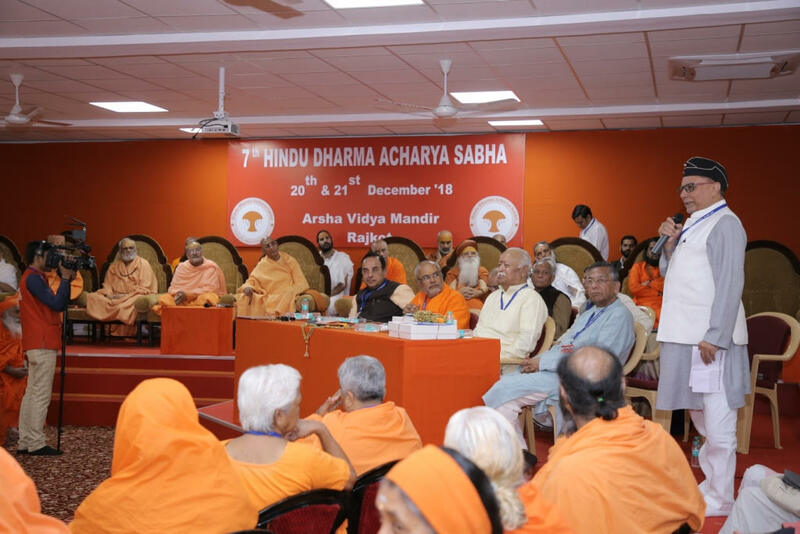 Acharya Sabha expressed concern about anti national activities in that area. 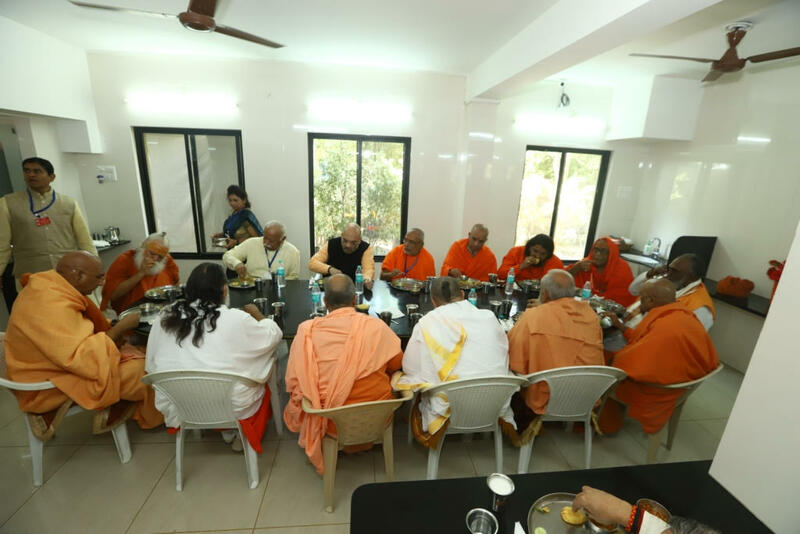 C. Sri Swamiji also gave presentation regarding NRC & efforts by certain section of academisia in USA, to defame Mahabharata & Ramayana. 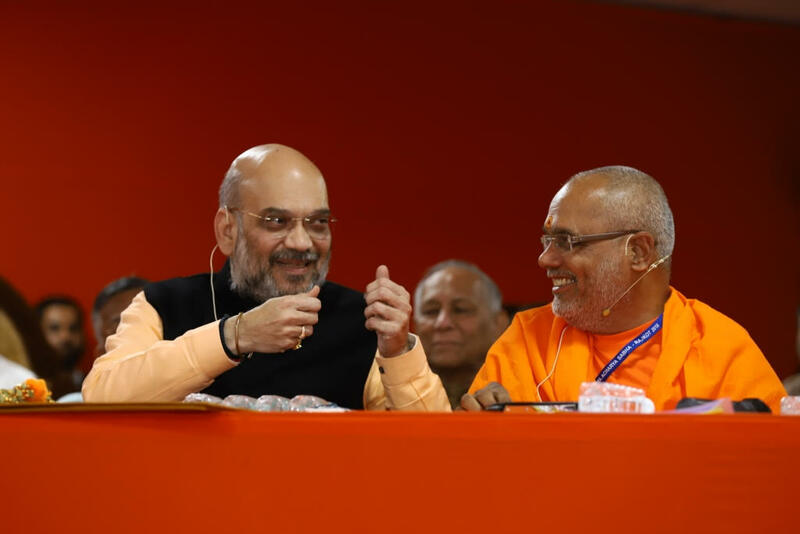 Afterwards, Sri Amitbhai Shah – National President B.J.P. talked in details about the projects, schemes & achievements of the government under leadership of Sri Narendra Modiji. He was happy to say that citizens in general, are becoming more patriotic & feel proud in being Bhartiya & Hindu. 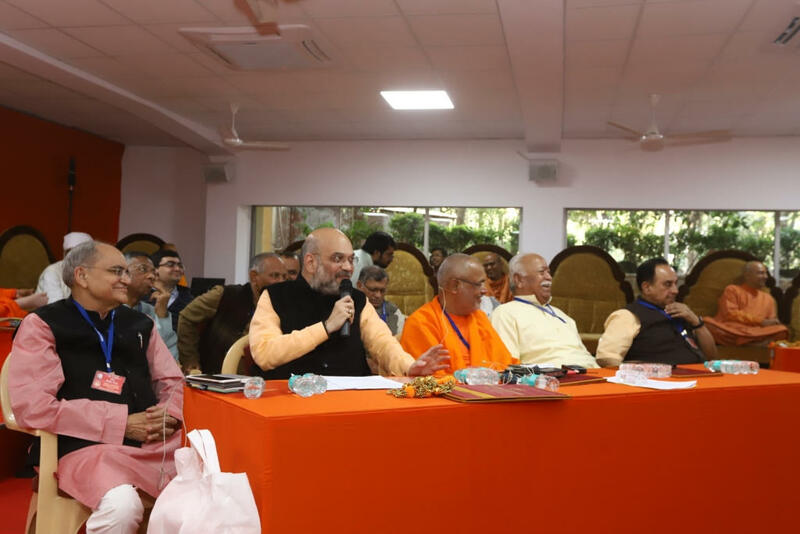 He also enumerated success of NRC, anti terrorist operations, introduction of Hindi language in North East States, policy on triple talk & abetment of religious conversion, etc. etc. Resp. 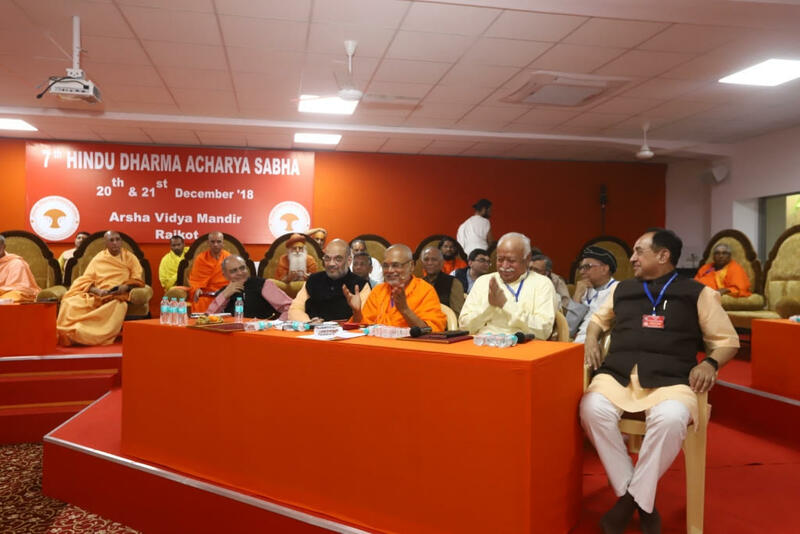 Sri Mohanji Bhagawat requested Acharyas to have Regional meetings. 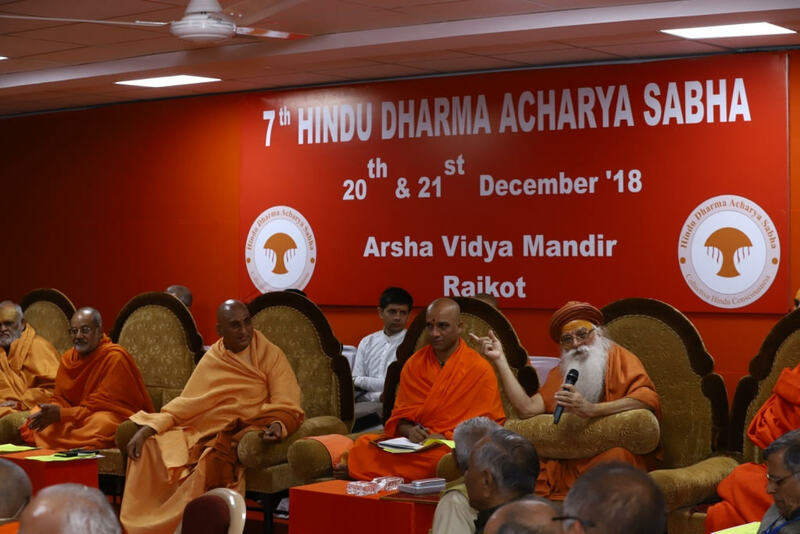 He felt the need to equip ourselves (Hindus) to be more intelligent, strategic & aware about contemporary issues, challenges to Dharma & Culture. He was quite confident that era of “New Bharat – Vijayi Bharat” has begun. 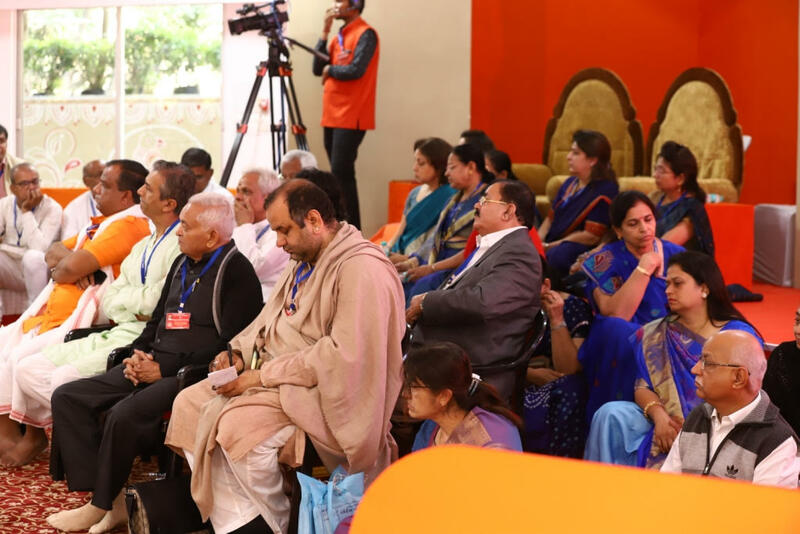 Wisdom of Vedas, which we have inherited, is the need of the hour we need to own it up, assimilate it & spread-distribute around for “Peace & Harmony” – within & without. 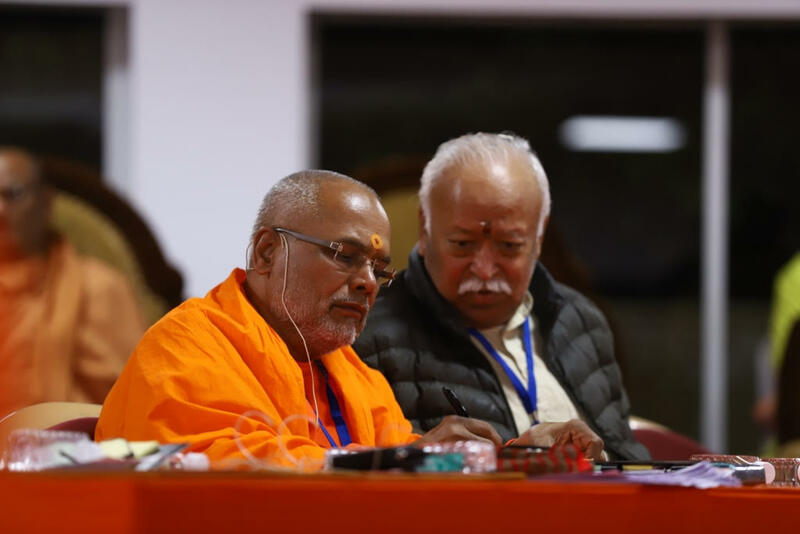 Kanchi Acharya Sri Vijayendra Saraswatiji joined & blessed the Sabha thru video conference & expressed support of the Matt. 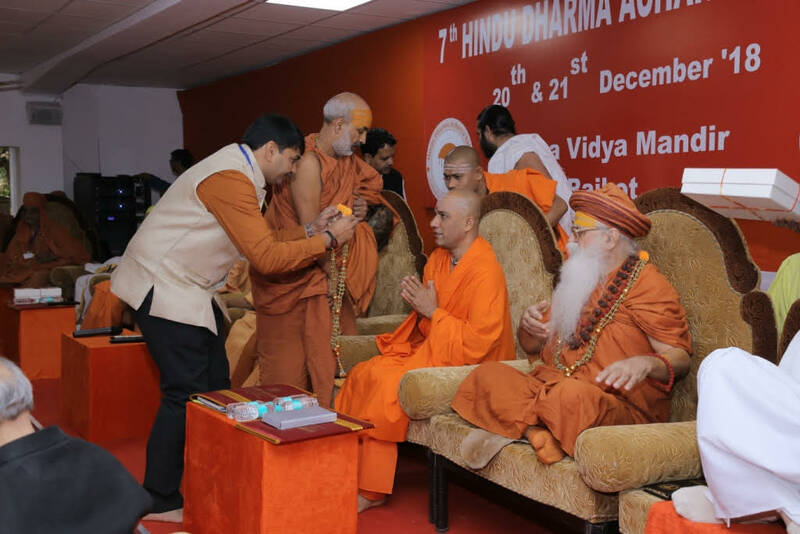 In the end, Acharya M.M.H.H. Avadheshanandaji louded the remarkable work done by P.Pu. 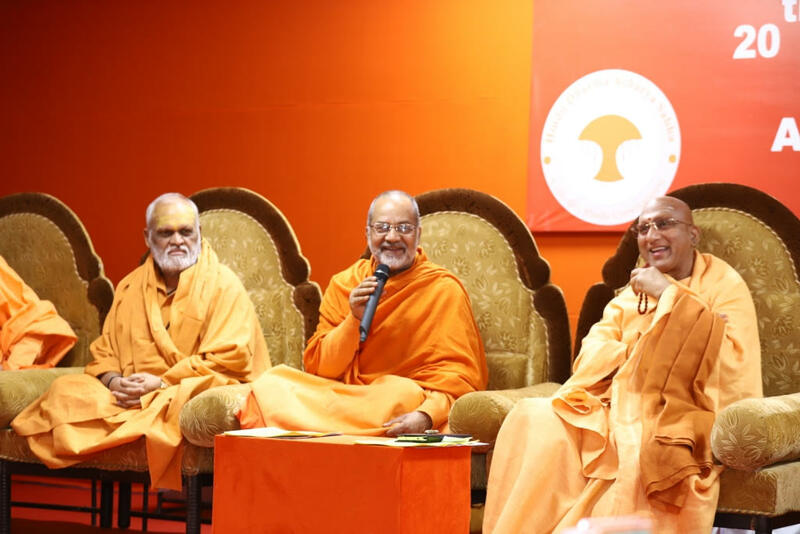 Swami Paramatmanandaji. 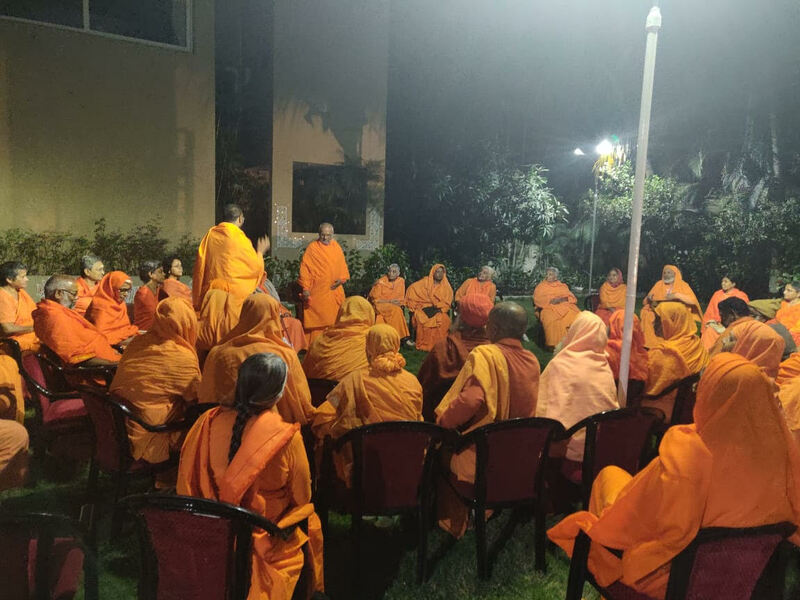 Whole sabha – all Acharyas & guests blessed. 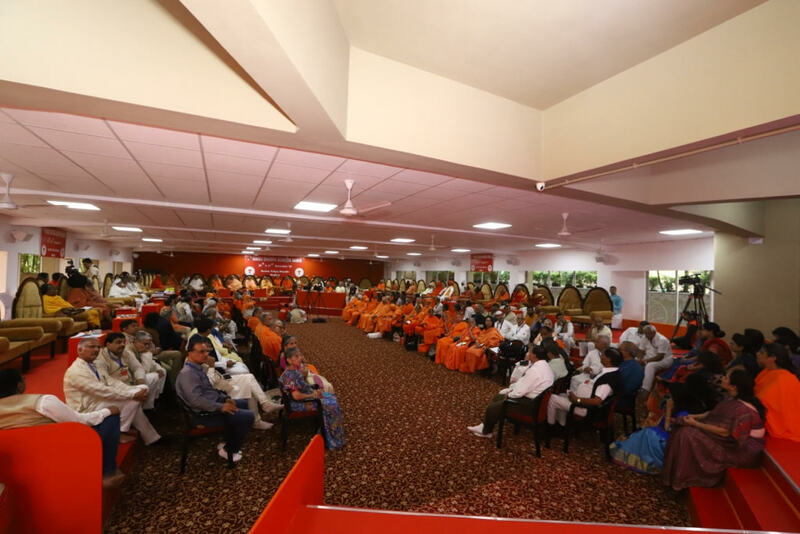 All the volunteers – devotees & Trustees for their extra – ordinary seva attitude & all arrangements.